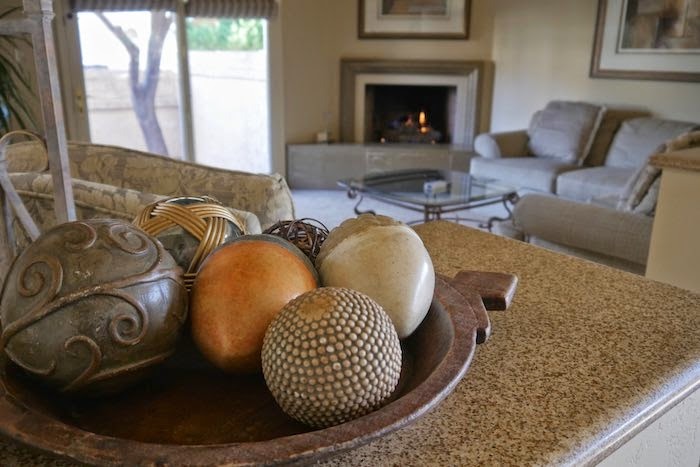 Scottsdale’s locally owned and operated Plaza Resort has been welcoming guests for nearly 39 years. The hotel has a variety of accommodations made up of: 170 Villa, Patio, and Bi-level suites, 10 executive lodge suites and 224 spacious guestrooms, all with a touch of rustic, Mediterranean flare. 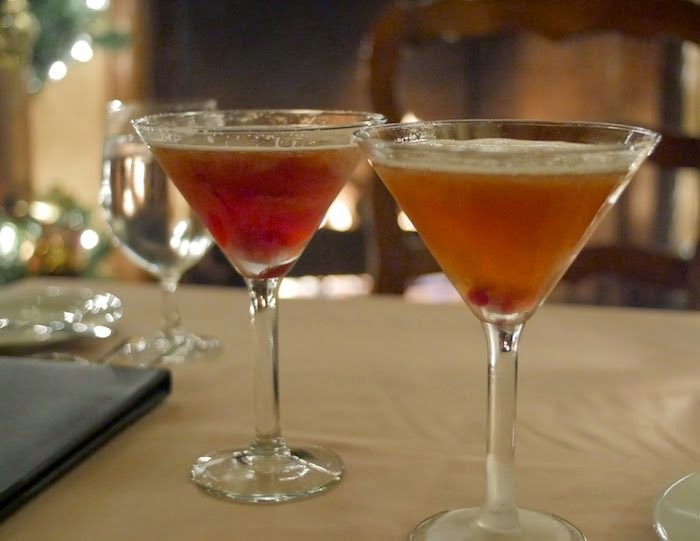 There are several dining options on the property including its signature fine dining restaurant Remington's which has an adjacent lounge featuring a full bar and live jazz. My husband and I recently stayed at The Scottsdale Plaza Resort and had the pleasure of chatting with Remington’s new Executive Chef, Steven Fowler. Fowler, who was brought on less than 6 months ago, is already making exciting changes to Remington's decades old menu. 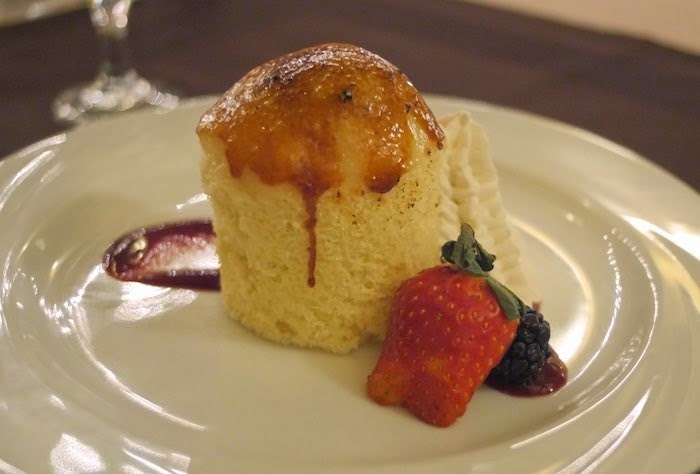 Though regulars may miss some of their favorite dishes, Fowler's plan is to have something for everyone, while creating a more relaxed yet still sophisticated dining environment. Fowler believes eating should be an event not just a meal, and has designed a refreshing new menu from his travels and past food experiences, giving diners something to enjoy and talk about. 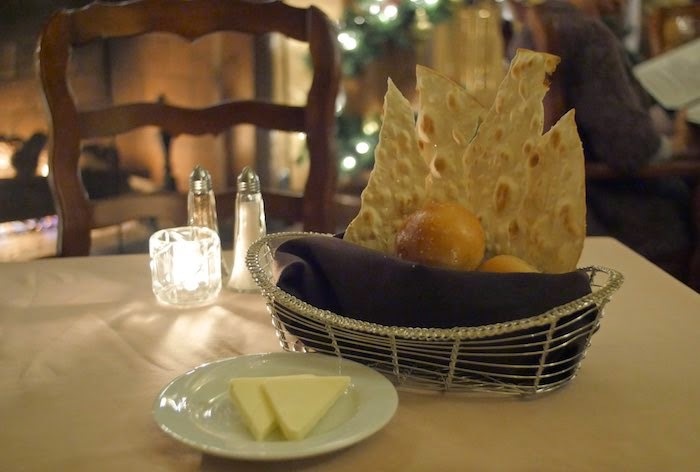 Wood beam ceilings, candles on every table and flickering fireplaces throughout the large back dining room sets the stage for a romantic dinner for two at Remington’s. The brightly lit painted ceilings and open feel of the front room is more appropriate for larger crowds. There's also an intimate outdoor patio were guests can enjoy incredible views while sipping on a glass of wine from the restaurant's exclusive collection. Reading the menu descriptions was enough to make my mouth water and the complimentary house made pretzel rolls added to the sensation. We started our meal with a bowl of the Portobello & Porcini soup, which was served with a sour cream and chive foam and porcini & beet mushroom shaped meringues. The intense earthy flavor from the porcini and its velvety texture made this one of the best mushroom soups I've ever had. 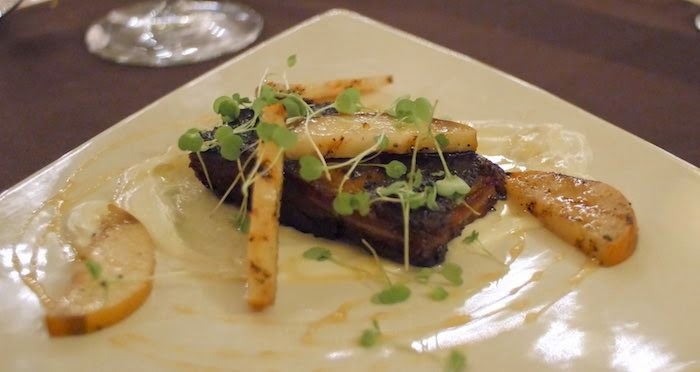 Up next was the Sambuca Flambéed Wild Boar Belly served with grilled Asian pears, a house-made cinnamon goat cheese, and micro arugula. The unique mix of flavors and textures of this dish was outstanding. 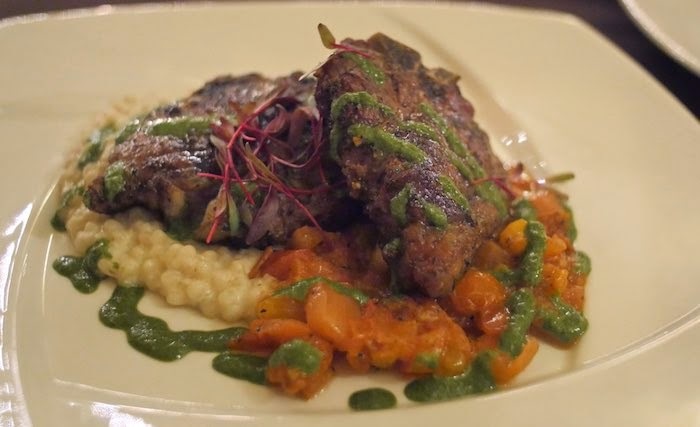 For my main course I selected the Mesquite Grilled Lamb T-Bone Steak served with cinnamon scented cous-cous and sautéed ginger tomatoes drizzled with a savory/sweet basil vinaigrette. The lamb was a wonderful dish that was cooked to perfection and beautifully presented. 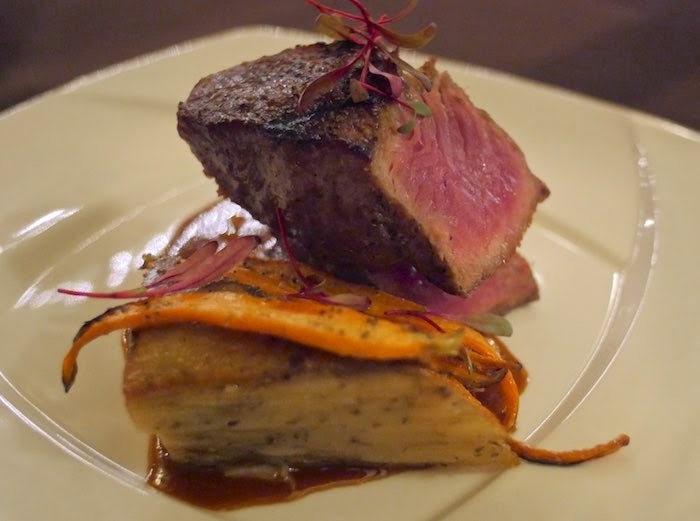 My husband chose the Mesquite Grilled Dry Aged NY Strip Steak served on top of Rosemary Potato Anna, a classic French dish of thinly sliced layered potatoes, and roasted baby heirloom carrots. The melt in your mouth texture and nutty flavor of the meat was superior to any I have tasted before. 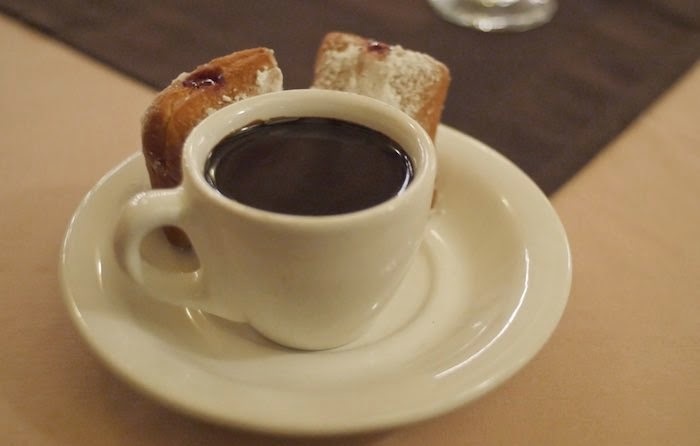 For dessert we tried the made-to-order doughnuts served alongside a cup of chili infused chocolate sauce and the Pionono, a sponge cake roulade filled with vanilla bean cream crowned with burnt sugar. While talking with Chef Fowler, and enjoying some of his house made lemoncello, he explained that the Pionono, was his re-creation of a dish he tasted in Spain. Both of the desserts were decadent and delicious and left us quite content. Remington's is certainly a restaurant I would return to, whether for a dinner in the main dining room or cocktails while enjoying music in the lounge. Chef Fowler's fresh approach to the long standing menu promises exciting new things for diners. 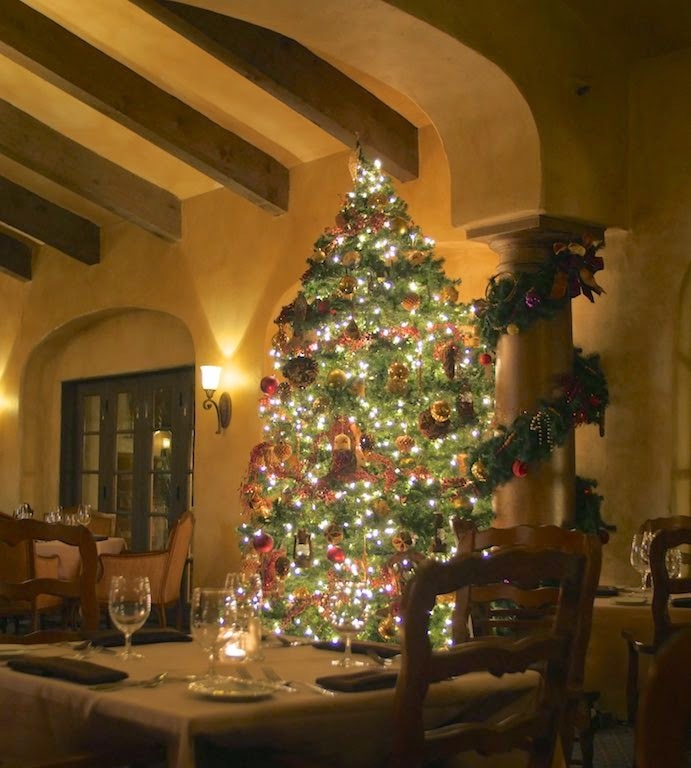 Atmosphere: We offer many diverse settings, from our upbeat lounge with live jazz floating through the air, to our warm and inviting dining rooms with flickering fireplaces or dine al fresco on our patio. Additional Information: Summoning the feel of an old world Spanish estate- we offer live entertainment most nites- exclusive collection of regional wines. Looks like a wonderful restaurant - both the food and the atmosphere! Wow, that sounds amazing. That lamb T bone is calling me. Everything looks absolutely delicious! I'll have to check it out when I'm in town. That looks like a great restaurant! I would have had the boar as well -- you made great choices. What a gorgeous place...and that meal sounds just out of this world! WOW! What a feast and beautiful atmosphere! My hubby would love that Wild Boar Belly! I was salivating also as I read your review and viewed your pictures! What a wonderful place to stay! Your meal looked amazing! I want to stay there. Comfort, relaxation, and delicious food, exactly what this girl needs now. Adding this to my "must-eat" list next time I'm in AZ visiting family! There is not a single thing there that I do not want to eat right this minute. This is a beautiful place! All the dishes look amazing! I totally want to visit when I go to Scottsdale! All these dishes look incredible! Sounds like a delicious dinner out. This restaurant looks so charming! Definitely the kind of place you can really relax. 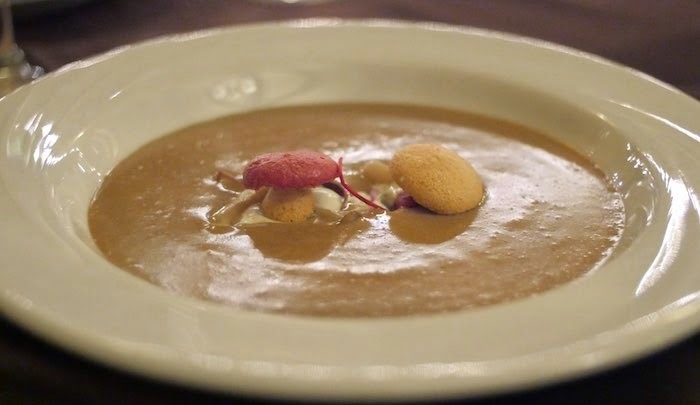 That mushroom soup looks incredible!